On the initiative of the Ministry of Culture, Haitian artists and works of art representative of the Haitian artistic landscape (painting, sculpture, fashion, crafts, graffiti and music), make shine, from December 5 to 9, the Haitian culture at the 5th edition of Art Beat at the Little Haiti Cultural Center. Located in Downtown Little Haiti in Miami, "Art Beat" is an annual art fair organized as part of Art Basel Week. It highlights emerging and renowned artists, painters, sculptors, art exhibits, murals and musicians, among others. 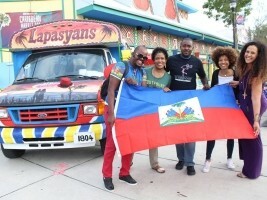 This fair is presented by the Little Haiti Optimist Foundation and the Northeast Second Avenue Partnership (NE2P). The Ministry of Culture, for two editions already, takes advantage of this showcase to promote the Haitian culture through the works of talented artists. This year, the Ministry is present on three levels : a craft fair, the traveling exhibition "Faces and Names and Works for Memory" and a talk about music production and works of art.